Our next PMA informational session for incoming 8th & 9th Grade interested Parents and Students will be on Monday, July 9th! As we get closer to the opening of the Porterville Military Academy next month, we would like to inform parents that PMA is currently full for incoming 7th-grade students with limited spots for 8th and 9th-grade students. If you are still interested in your 8th or 9th-grade student attending PMA, please register at the PUSD Pathways Office (600 W. Grand Ave.). The Porterville Military Academy eventually will expand to grades 6-12. 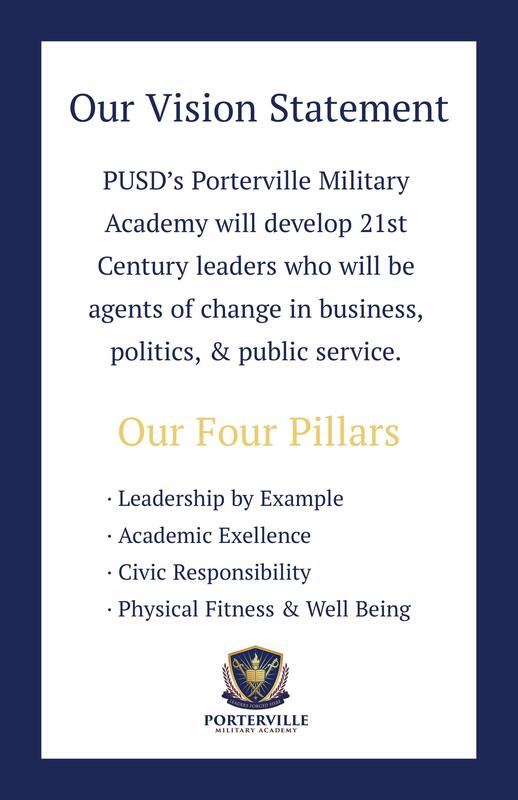 There will be another information session on the Porterville Military Academy on Monday (July 9) in the PUSD Board Room (600 W. Grand Ave.) with the Spanish-speaking session at 5:30 p.m. and English-speaking session at 6:30 p.m.
Parents/Cadets: PMA will hold mandatory orientations for all incoming cadets on the following dates and times. The first hour will be dedicated to sharing critical information and the second half hour will be dedicated to a question and answer session. Jasmine Mejia and Celeste Puente Bedolla will receive $20,000 in financial support for college, as well as a laptop, and textbook credits. Dr. Nate Nelson named new superintendent, effective July 1.